Up to several thousand species of spiders are thought to exist in the United States; obviously many of these species are found in the Pacific Northwest. Thankfully, many of these spiders stay out of doors, doing their part in the ecosystem as predators of various insect species that, without spiders, could raise serious risks themselves to nature and to human health. It is only when spiders, or the webs they create, attach themselves to our homes, business structures, and personal property that they become a concern. In general, control of spiders involves a combination of inspection, identification, and prevention and sanitation methods. Knowing the spiders that are problematic in and around a structure can assist a homeowner to know how to control their presence. Spider populations indoors can been kept to a minimum through various methods of weather proofing and screening, reducing the amount of vegetation around a structure, modifying outdoor lighting to reduce attracting the insects that spiders want to eat, keeping firewood away from structures, can all help in reducing the risk of spider infestation. In worst case scenarios, especially where properties are located in or near wooded areas ideal for spider populations, regular professional treatment services may also be a necessary option to pursue. In most cases, general spider populations build during the year as flying pests such as flies, mosquitoes, and other insect populations grow. Most spider populations in the Northwest peak around September 1 and gradually decrease thereafter until local fall frost conditions set in. Well known for the distinctive black color with the orange hour-glass shaped mark on its abdomon, the female black widow spider (Latrodectus spp.) can inject a neurotoxin with its bite that requires medical attention. Black widow spiders tend to shun light, preferring living in cracks, crevices, and other sheltered locations, and are most active at night. Most frequently they can be found in places such as firewood piles and other outdoor areas of storage or refuse, in cracks in brick walls, or in crawl spaces. They build a web that has no regular pattern to it and generally will hang upside down in the web waiting for prey. Black widows can be found with some frequency in western Oregon from the Umpqua and Rogue Valleys southward, mainly in urban areas. Apparently due to the damper, cooler climates, their native range diminishes quickly as one travels north along the I-5 corridor so that black widows are extremely rare from the mid-Willamette Valley (Salem area) northward. In some areas of eastern Washington and Oregon, where the climate is drier, black widows tend to be reported with a greater frequency in spot locations. The males of the black widow spiders (which are smaller, much lighter in color) do not produce venom upon maturity and are not a threat to humans. There is another common spider species, the brown cellar spider, which is shaped much like a black widow, which frequents crawl spaces under houses throughout western Oregon and Washington. This spider is dark brown in color with no markings on it. Unlike the black widow, the brown cellar spider is not poisonous to humans and is thus not considered a health risk. Of all the biting spiders found in urban areas, the yellow sac spider (Chriacanthium spp.) may be the cause of most human spider bites in western sections of the Pacific Northwest. It is extremely prolific and, in structures, can be found in attics, crawl spaces, and building interiors along ceilings and ceiling corners. 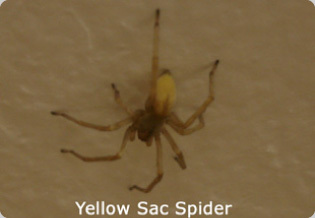 Yellow sac spiders, generally about ¼ inch in size and yellow to light green in color, build flattened silk tubes for shelter in ceiling corners. Their venom is a cylotoxin that can result in symptoms from localized redness, swelling, and pus developing in the wound. In rare cases symptomatic reactions such as cramping or nausea may occur that would require medical attention. Ulceration of the wound may result, taking several weeks to completely heal. In 1987, a paper published in the peer-reviewed journal Toxicon presented a 'study' that accused the bite of the hobo spider (Eratigena agrestis, formerly known as Tegenaria agrestis), known to have come into the Pacific Northwest in the 1930s, of producing necrotic lesions similar to brown recluse spider bites (see below on brown recluse spiders). Necrotic lesions can result in the destruction of skin tissue and can take several months to heal. This published information was picked up by other academic sources, including some universities and the U.S. Center for Disease Control (CDC). The news media in the United States ran with the story of how 'dangerous' the hobo spider was. It is true that brown recluse spider bites can cause necrotic lesions due to the venom they carry. However, in spite of some isolated medical and media claims made over the years, the brown recluse spider (Loxosceles spp.) is not established in the Pacific Northwest and thus cannot rightly be blamed for such kinds of wounds in this part of the country. The range of the brown recluse spider is limited to the southern Plains states and lower Mississippi valley. The last known confirmed sightings of a brown recluse spider in the Pacific Northwest were in Prosser, Washington in 1978 and in Central Point, Oregon in 2000; in both cases the spiders came in with personal items shipped from Kansas where the brown recluse is extremely plentiful. With regard to necrotic lesions, in reality it is generally not possible—without having the spider in hand—to determine whether the cause of the bite and resultant tissue damage found on a person is indeed from a spider. Many other causes of necrotic lesions also exist (tick bites, skin cancers, Lyme disease, etc.) which may have nothing to do with any kind of spider. Hobo spiders, along with other scientifically related species such as the domestic house spider (Tegenaria domestica) and giant house spider (Eratigena gigantea, formerly known as Tegenaria gigantea), build funnel webs at ground level to catch their prey. They are extremely difficult to positively identify since they look—to the untrained eye—so similar to each other. It is prudent to consult academic web sites or a state agriculture entomological specialist for a positive identification if one suspects that a hobo spider (or other Tegenaria or Eratigena spider) has been found. Leupitz Pest Control can provide experienced, professional consultation and appropriate measures to control excessive spider populations. Call us if you need assistance with spider issues.